A job is a particular project or activity for which expenses are being tracked. When a payroll distribution is entered into the Payroll pack­age, the wage expense amounts can be distributed among the appropriate jobs. These distributions are posted to the Job Distribution file and are printed out on this report. The report shows the total expenses incurred by each different job and further breaks down the wage expenses by the wage expense accounts, showing detail of the expense distributions. If the Print A/P Job Info? flag is set to Y in Payroll Setup, and the A/P package is being used, Accounts Payable distributions will appear on the report. If the Print A/R Job Info? flag is set to Y, the same will be true of Accounts Receivable distributions. The Job Distribution file may be purged when the report is printed, or the data may be retained on file for future reference at your option. Enter Y to print the report. Enter N if you do not wish to have the report printed, so you can purge data without printing the report. Enter Y if you wish to have the Job Distribution file purged for the range printed to conserve disk space. Enter N if you wish to have all of the data in the Job Distribution file retained for future reference. Enter the first job to appear on the report. Enter the last job to appear on the report. This field defaults to the starting job number to make it easy to print the report for a single job. Enter the beginning date of the period for which the report is to be printed. 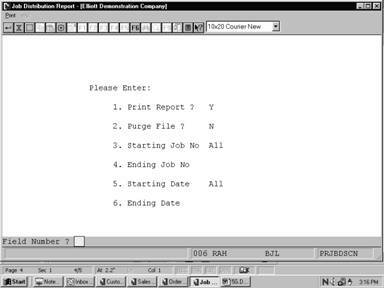 Enter the ending date of the period for which the report is to be printed. This field defaults to the starting date to make it easy to print the report for a single date.